Before becoming a full-time faculty member at Wilberforce University, Dr. Michael SaintLuke-Robinson was the Associate Dean for Academic Affairs at The Illinois Institute of Art – Tinley Park. It is at this college where Dr. Robinson embraced the principles and guidelines set forth by FERPA, Title IX, and HLC as he worked with students and families and provided direct support for students of color. Dr. Robinson monitored retention of students of color, developed an orientation experience for prospective and continuing students of color, and supervised and advised students, assistants, and leaders. 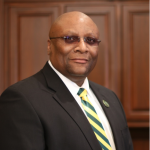 Also as the Associate Dean for Academic Affairs, Dr. Robinson collaborated with staff and faculty to plan educational, leadership, social and cultural programs and services that promote the success of students of color and students from other diverse backgrounds. Dr. Robinson started as the Academic Director at the Illinois Institute of Art – Chicago, managing the Advertising, Graphic Design, Digital Photography and Web Design programs. Dr. Robinson’s designs had placed 3rd at the National Association of Golf Owners in Las Vegas, Nevada in 1992. Michael was the art director for the flight simulator game A-10 Attack series. As the Senior Graphic Designer for Life Fitness Corporation, Dr. Robinson assisted the marketing team in creating signage for their Treadmills, Life Cycles, and Cross-trainers as well as their Hammer Strength weight equipment. He also worked for the Mazda Corporation, Sears, Neiman-Marcus, Abbott Laboratories, Allstate Insurance, Ryobi, Snapper, and Poulan-Weedeater. Dr. Robinson has climbed the ranks in the design world and has formed design studios and graphic departments in Illinois, Wisconsin, Texas, and Arkansas. He has also developed and managed both a design studio and a school, in Riyadh, Saudi Arabia. Dr. Michael SaintLuke-Robinson received his Ph.D. in Organizational Leadership and Management from Capella University in Minneapolis, Minnesota, his MBA in Management from Olivet Nazarene University in Illinois, and his Bachelor Degree from Illinois State University in Normal, Illinois. Serves as the Executive Administrative Assistant to the Office of the Provost. 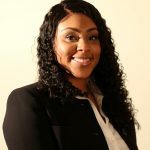 Mrs. Davis is a graduate of Wilberforce University, and currently enrolled into the Master of Science in Rehabilitation program.